Podcasting has had resurgence in the last few years. New technology and celebrity podcasts are bringing in loads of new listeners. Now it's time to consider how you can use a podcast to market yourself and your business. Here are the trends, the popular show formats, numbers and simple starters guide to help you decide. Zero barrier to entry. No industry gatekeepers keeping you out. No expensive equipment is needed. You can have a global audience. You can be seen as an expert. You can attract other experts who will bring you their audiences. You can create close relationships with a loyal audience. It’s getting more accessible for listeners. Podcating is about a decade old, so it’s not new. But here's what why we haven't heard much about. Podcasting was hot in 2005, partly because Apple created a place to gather that content. But it didn’t stay hot for long because the audience was really limited to people who could handle the downloading and syncing between a computer and an ipod. And the content was mostly tech, and then more tech. Podcasting sort of laid there unnoticed until we got the smartphone. Then we could easily find and listen to the shows we wanted. What could you do with a podcast? Talk about what you love and become an authority figure in that area. Create a course with lessons and workshops. Write a book and make episodes to summarize each section. Then direct people to your landing page. Make an audio blog. If you’re already writing, read it for people who prefer to multitask. Why podcasting will keep growing. Number of mobile devices is rising. They say that the number of smartphones in use will be 2 billion in 2015. The podcast app from apple is now standard in iOS 8. Android Auto will be placed in many new vehicles, and one of the 1st apps on it will be Stitcher Radio, which gathers over 20,000 podcasts to stream directly into your car. And Stitcher’s CEO says that the number of vehicles with this feature will be in the millions this year. Smart speakers, like The Cone, are coming our way. It’s a standalone device that can learn your tastes and preferences. It provides streaming music, podcasts and Internet radio. It can also directly stream regular radio stations, and it works with Apple’s AirPlay to stream your own music from Apple devices. Celebrities are starting podcasts, and bringing their loyal audiences with them. We may see the same boost that Twitter saw when celebrities joined got on that platform. Alec just got his own talk show, so the podcast is ending. But I'm sure it had a role in getting executives to see that he's a great host. So how many people are listening to podcasts? In 2011 Libsyn, a media host for podcasts, reported 1.6 billion downloads over 50 million users. An American study in 2012 found nearly 1/3 of internet users were also listening to podcasts. 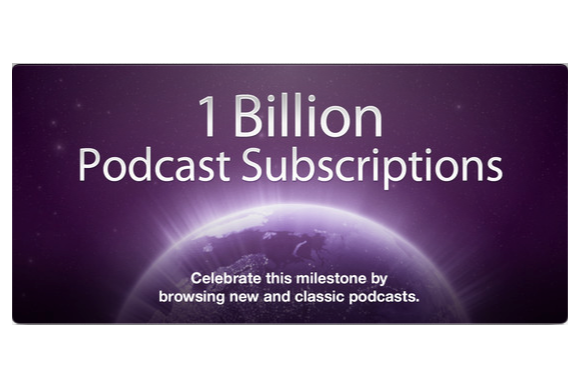 And most recently, in July, Apple celebrated 1billion podcast subscribers And Apple only accounts for 1/3 of the market. So there could be 3 billion out there. So why use podcasts as your media outlet? How can you make money with a podcast? Getting more sales & leads by being perceived as an expert. Once you know your audience, you can reach out to sponsors who are a good match. Themidroll.com matches premium podcasts with top sponsors. Their studies found that 64% of their listeners bought something after hear about it on a podcast. And when put up against radio there has been 200-300% more engagement from podcast advertising. Unlike radio and print advertising, their podcast sponsorship lasts. They can have a return for years instead of weeks. It doesn’t take much energy to create a good value proposition for sponsors. Create premium content. Have a limited release of your podcast with a membership site to allow access to all shows. Have a membership site that allows access to your back catalog. Mixergy does this. They interview entrepreneurs in the tech space. And will over 1000 shows, there’s a lot of valuable information there. Pay a monthly fee and it’s yours. Sell your own information products. Your audience has been listening to you. You’ve been building trust and giving value, now give more. Great! How do I make a podcast? Create an audio or video file. Make some nice cover art and give it a great title. Upload it to a media host who will put it out on an RSS feed Submit your feed to Itunes, Stitcher and other directories . Listeners find your show, download it to listen once or subscribe to receive more And that’s a podcast! A lot more info over at Pat Flynn's site. The key to success is to niche down your content and go for a specific interest group. The main topics are getting quickly saturated. So you don't want to do tech startups, but tech startups from Africa that only bootstrap, that's more like it. Find the right space in the media market, and make it yours! If you have any questions or something you could add, please share with us in the comments.